This is dependable premium dual fuel lantern that burns very bright and can be adjusted down for longer burn times. One 1.3 pint tankful of gasoline lasts about two long evenings. The Coleman Premium Dual Fuel Lantern can burn Coleman White Fuel or regular unleaded gas. In a Doomsday survival or camping scenario, having a bright light in at night (especially if it is pitch black) can be appreciated in the appropriate situation (i.e, a camping situation or situation in which you are not trying to stay hidden). Gasoline is something that can be scavenged from your vehicles in a Doomsday survival scenario. Coleman lanterns have historically proven to be very dependable over decades. These Coleman fuel version lanterns are much more efficient and less costly from a fuel perspective versus propane lanterns. One gallon of gas will last a long time using this lantern. Having a siphon available would make it possible to just siphon gas from your vehicle to use in this lantern. 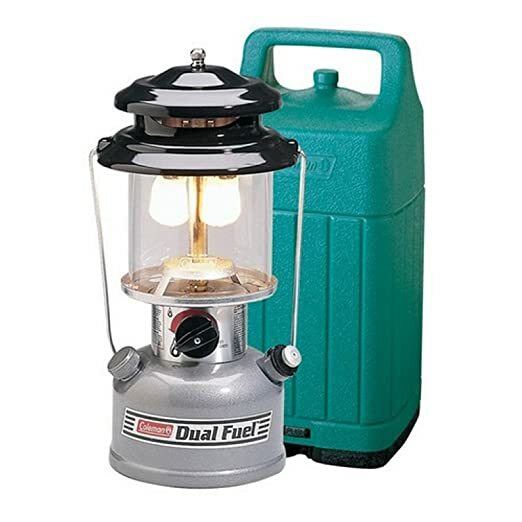 This particular model Coleman Premium Duel Fuel Lantern comes with the hard carry case. There is another version of the same lantern available without the hard carry case. Also, there is a slightly larger slightly more costly model of this Coleman Premium Duel Fuel Lantern (with Powerhouse written on the fuel tank) that has a 2 pint tank, and burns brighter. There is a link to both of these versions in the recommended accessories below. The following YouTube video is a review & demo of the Coleman Premium Dual Fuel Lantern with hard carry case. The following YouTube video is a review & demo of the Coleman Premium Dual Fuel Lantern. The following YouTube video demonstrates replacing the mantels on a Coleman Premium Dual Fuel Lantern. "I bought this Coleman lantern to use while RV camping. I have had Coleman lanterns for many years, and they have always been good. I think this new one is the best one I have ever bought. It is well made, and I like the carrying case." "Perfect! I got this lantern for Christmas, and I love it. It is EXTREMELY robust! The quality is very good (made in the USA). The light it gives off is very bright, so I don't see why you would want to get the PowerHouse lantern (the next size up). If you did you may damage your eyes!" "This is a great lantern, have an older model that is still in use and works great after 19 years. Had to buy another one as the price was to good to pass up, and it is still made in the USA. Highly recommend this lantern for camping or power outages. The liquid gas is much better than propane bottles as it last twice as long as my friends propane." "Awesome. Super bright. Dependable. I never go fishing or camping without this light. I finally had to buy a new one when my old Coleman lantern gave out after more than 15 years! Love these lights." "Just right for emergencies. Never have had any problem with it. Dual-fuel beats propane. Nice, sturdy case as well." "Love these lanterns! Great pkg price with the carry, storage case included! Throws tremendous amount of light and lasts a good amount of time per fill! Easy to operate and great quality!" "Fantastic lantern that works precisely as it should. This lantern is very well made, provides an astounding amount of light and is the perfect size. I believe this is a must have item. Under certain circumstances batteries for other lighting devices could potentially be hard to come by. While unlikely, the piece of mind provided by having a lantern that can operate not only on camp fuel, but readily available unleaded gasoline is a plus. I am a fan of the Coleman Brand, and while many of their products may not stack up to those offered years ago (not much does these days) this lantern is one of the exceptions, along with their Dual Fuel Stove that if properly maintained will last you a lifetime."